There are 86 Assisted Living Facilities in the Clearwater area, with 28 in Clearwater and 58 nearby. The average cost of assisted living in Clearwater is $2,499 per month. This is lower than the national median of $3,346. Cheaper nearby regions include Safety Harbor with an average starting cost of $2,475. To help you with your search, browse the 581 reviews below for assisted living facilities in Clearwater. On average, consumers rate assisted living in Clearwater 4.0 out of 5 stars. Better rated regions include Largo with an average rating of 4.2 out of 5 stars. Caring.com has helped 20 families in Clearwater find high-quality senior care. To speak with one of our Family Advisors about assisted living options and costs in Clearwater, call (855) 863-8283. Clearwater, located along Florida's Gulf Coast, has beaches that are consistently ranked among the most beautiful in the U.S., bountiful seafood eateries, and other area attractions making it a perfect destination for seniors who enjoy sunshine and relaxation. It's no surprise that the area is home to 21,300 seniors, some of whom may be in need of assisted living services. To support these seniors, there are 28 assisted living facilities in Clearwater, with another 58 available in the surrounding areas. In Clearwater, as in the rest of Florida, assisted living facilities (ALFs) are governed by The Agency for Health Care Administration's Assisted Living Unit. Florida does not levy taxes on social security income, pensions or retirement savings account withdrawals. Seniors living in Clearwater may benefit from Florida's tax-friendly status. Clearwater's subtropical climate means year-round warmth. The city gets 240 sunny days per year, compared to the national average of 205, making it an ideal location for seniors who love outdoor activities. Clearwater has good air quality. On a scale where 100 represents areas with the best air quality, the city ranks 67, slightly higher than the U.S. average of 58, indicating that the area might be ideal for seniors with COPD or asthma. The cost of living in Clearwater is 105.4, slightly higher than the national average of 100. Healthcare ranks slightly below the average at 99, suggesting that the area might be affordable for seniors. The Pinellas Suncoast Transit Authority (PSTA) operates a public bus system throughout the Clearwater and St. Pete area. Seniors age 65 and older can apply for a PSTA Senior/Disabled Photo ID at their nearest PSTA Customer Service Center so they can get discounted rates on public transportation. Clearwater has a violent crime rate of 30.4 and a property crime rate of 51.9, both considerably higher than the national averages of 22.7 and 35.4, respectively. Although these crime rates are higher, they are unlikely to affect seniors in secure assisted living units. Assisted Living costs in Clearwater start around $2,499 per month on average, while the nationwide average cost of assisted living is $4,000 per month, according to the latest figures from Genworth’s Cost of Care Survey. It’s important to note that assisted living rates in Clearwater and the surrounding suburbs can vary widely based on factors such as location, the level of care needed, apartment size and the types of amenities offered at each community. 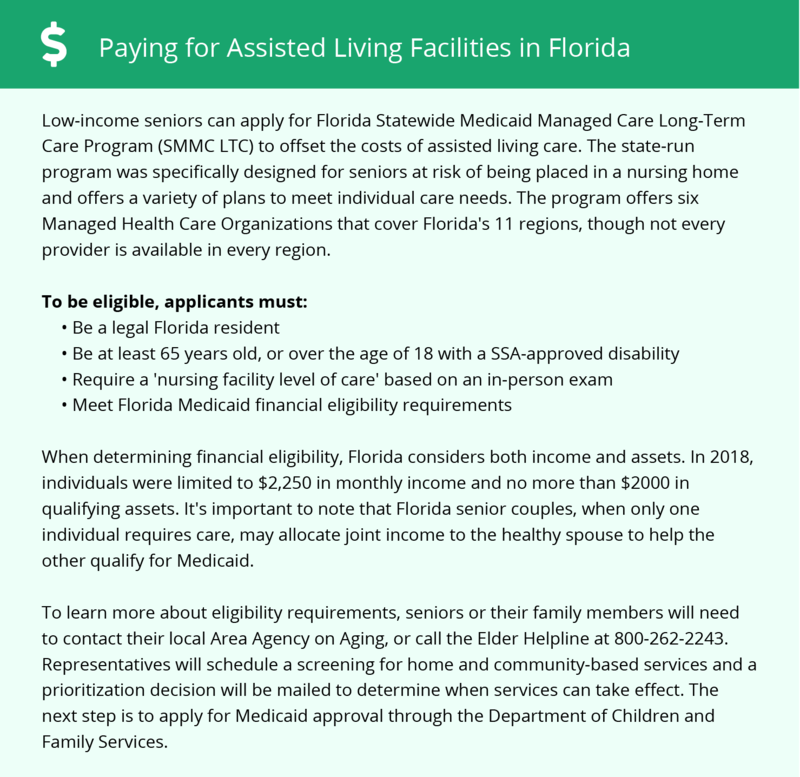 Seniors living in Clearwater have two financial assistance options that help cover the costs of assisted living: the Medicaid Managed Care Long-Term Care Program and the Optional State Supplementation program. Seniors can apply both for through the Pinellas County Department of Children and Families Office. Clearwater and the surrounding area are home to numerous government agencies and non-profit organizations offering help for seniors searching for or currently residing in an assisted living community. These organizations can also provide assistance in a number of other eldercare services such as geriatric care management, elder law advice, estate planning, finding home care and health and wellness programs. To see a list of free assisted living resources in Clearwater, please visit our Assisted Living in Florida page. Clearwater-area assisted living communities must adhere to the comprehensive set of state laws and regulations that all assisted living communities in Florida are required to follow. Visit our Assisted Living in Florida page for more information about these laws.